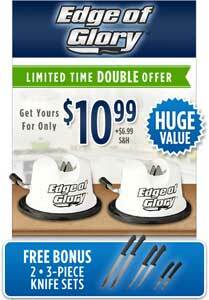 With the Edge of Glory, you can restore your old, dull knives to like-new levels of sharpness in just moments! The secret is the Edge of Glory’s dual hardened Tungsten Carbide teeth. Its super-suction base sticks to any surface, and then all you do is swipe any knife through the Edge of Glory. Now you can slice, dice or chop with ease! The Edge of Glory works on all kinds of knives – even serrated blades – and saves you the trouble of having to buy an entirely new set of kitchen knives!